Tell her that you love her. You've got nothing to lose and you'll always regret it if you don't. Why See San Francisco Symphony - Love Actually? Join the San Francisco Symphony for a live-to-screen concert performance of the charming contemporary holiday classic. Since its release in 2003, it has since become an unmissable treat to be enjoyed during the festive season. So prepare to be swept away into the lives and loves of a group of Londoners as they gear up for Christmas! From lovesick to newly married and all stages in between and after, Love Actually reminds us that love is all around, all we have to do is look closely. Sound good to you? 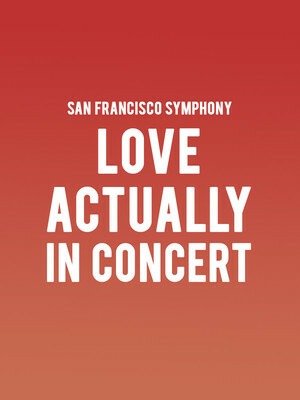 Share this page on social media and let your friends know about San Francisco Symphony - Love Actually at Davies Symphony Hall. Please note: The term Davies Symphony Hall and/or San Francisco Symphony - Love Actually as well as all associated graphics, logos, and/or other trademarks, tradenames or copyrights are the property of the Davies Symphony Hall and/or San Francisco Symphony - Love Actually and are used herein for factual descriptive purposes only. We are in no way associated with or authorized by the Davies Symphony Hall and/or San Francisco Symphony - Love Actually and neither that entity nor any of its affiliates have licensed or endorsed us to sell tickets, goods and or services in conjunction with their events.